Our modern toggle and rocker light switches are designed for residential homes and are rated for 15A and 120/227 V. Available in a variety of stylish colors, UL listed and CSA certified. Perfect for new construction or older home renovations. 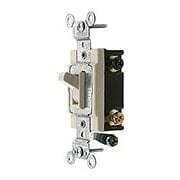 The Leviton single-pole toggle switch is a time tested classic. Designed for residential use, it's constructed of impact-resistant thermoplastic, and its large head, hardened triple-drive screws allow for easy installation. Compatible with a wide range of our Leviton wall plates, it comes in your choice of six popular colors. The sleek, smooth Leviton Decora rocker switch adds modern style to your decor. Designed for residential use, it's constructed of impact-resistant thermoplastic for long-lasting wear. Compatible with a wide range of our Leviton wall plates, it comes in your choice of six popular colors. 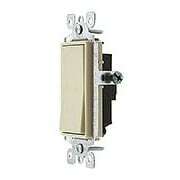 The sleek, smooth Leviton Decora 3-way rocker switch adds modern style to your decor. Designed for residential use, it's constructed of impact-resistant thermoplastic for long-lasting wear. Compatible with a wide range of our Leviton wall plates, it comes in your choice of six popular colors. 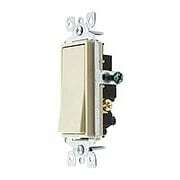 The Leviton single-pole combination toggle switch is a time tested classic. Designed for residential use, it allows you to control two separate fixtures with a single gang cover plate - a great solution when wall space is at a premium. 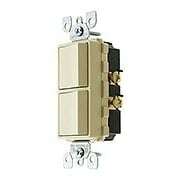 Compatible with a wide range of our Leviton wall plates, it comes in your choice of three popular colors. 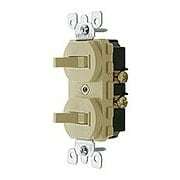 The Leviton single-pole combination rocker switch is a time tested classic. Designed for residential use, it allows you to control two separate fixtures with a single gang cover plate - a great solution when wall space is at a premium. 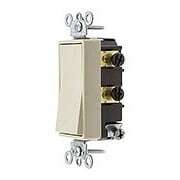 Compatible with a wide range of our Leviton wall plates, it comes in your choice of four popular colors. 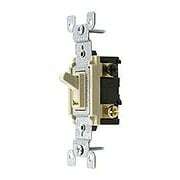 The Leviton, 4-way toggle switch is a time tested classic. Designed for residential use, it's constructed of impact-resistant thermoplastic and its large head, hardened triple-drive screws allow for easy installation. Compatible with a wide range of our Leviton wall plates, it comes in your choice of six popular colors. The black and gray color options are only available in commercial grade. The sleek, smooth Leviton Decora 3-way rocker adds modern style to your decor. Designed for residential use, it's constructed of impact-resistant thermoplastic for long-lasting wear. Compatible with a wide range of our Leviton wall plates, it comes in your choice of six popular colors.